Objective A biomarker with increased specificity for cervical dysplasia compared with human papillomavirus (HPV) testing would be an attractive option for cervical cancer screening among HIV-infected women in resource-limited settings. p16INK4a has been explored as a biomarker for screening in general populations. Design A 2-year cross-sectional study. Setting 2 large HIV primary care clinics in western Kenya. Participants 1054 HIV-infected women in western Kenya undergoing cervical cancer screening as part of routine HIV care from October 2010 to November 2012. Interventions Participants underwent p16INK4a specimen collection and colposcopy. Lesions with unsatisfactory colposcopy or suspicious for cervical intraepithelial neoplasia 2+ (CIN2+; including CIN2/3 or invasive cervical cancer) were biopsied. Following biopsy, disease status was determined by histopathological diagnosis. Primary and secondary outcome measures We measured the sensitivity, specificity and predictive values of p16INK4a ELISA for CIN2+ detection among HIV-infected women and compared them to the test characteristics of current screening methods used in general as well as HIV-infected populations. Results Average p16INK4a concentration in cervical samples was 37.4 U/mL. After colposcopically directed biopsy, 127 (12%) women were determined to have CIN2+. Receiver operating characteristic analysis showed an area under the curve of 0.664 for p16INK4a to detect biopsy-proven CIN2+. At a p16INK4a cut-off level of 9 U/mL, sensitivity, specificity, positive and negative predictive values were 89.0%, 22.9%, 13.6% and 93.8%, respectively. The overall p16INK4a positivity at a cut-off level of 9 U/mL was 828 (78.6%) women. There were 325 (30.8%) cases of correct p16INK4a prediction to detect or rule out CIN2+, and 729 (69.2%) cases of incorrect p16INK4a prediction. Conclusions p16INK4a ELISA did not perform well as a screening test for CIN2+ detection among HIV-infected women due to low specificity. Our study contributes to the ongoing search for a more specific alternative to HPV testing for CIN2+ detection. This study is the first to investigate p16INK4a ELISA as a primary cervical cancer screening tool in an HIV-infected population. The very large sample size of 1054 HIV-infected women provides well-powered estimates of the sensitivity, specificity and predictive values of p16INK4a ELISA. In order to evaluate p16INK4a as a stand-alone biomarker for cervical cancer screening, our study uses methods that would be feasible and readily employable in low-resource settings, including performing non-directed p16INK4a specimen collection instead of preferentially sampling acetowhite lesions via colposcopy. This non-directed sampling may have decreased the sensitivity and specificity of p16INK4a for cervical intraepithelial neoplasia 2+ (CIN2+) detection, compared with prior studies. We ascertained disease using colposcopy with biopsy only of lesions that appeared suspicious for CIN2+, which may have led to underascertainment of true disease, and to a lower precision of our sensitivity and specificity estimates. Cytology-based screening programmes, though successful in resource-replete settings, are not always the best option in low-resource settings due to costs, laboratory infrastructure and need for multiple visits.13–16 The WHO published updated guidelines for screen-and-treat strategies for cervical cancer control in low-resource countries in 2013.17 These guidelines preferentially recommend screening with HPV testing, followed by treatment for women who test positive. However, among HIV-infected women, high HIV-HPV co-infection rates lead to concerns about decreased specificity for cervical disease.18 ,19 With rates of HPV positivity up to 75% in HIV-infected women,20 HPV testing could lead to an overburdening of the referral system or overtreatment in screen-and-treat settings. With limitations to current screening options, a resource-appropriate objective method for testing HIV-infected women is needed. p16INK4a ELISA has not been widely studied in an HIV-infected population or in low-resource settings. We conducted a cross-sectional study in an HIV primary care setting in western Kenya to measure the sensitivity, specificity and predictive values of p16INK4a ELISA for CIN2+. We sought to describe the test characteristics in a study that was adequately powered to examine the demographic, HIV-related and reproductive factors impacting test accuracy. We conducted a cross-sectional study to define the sensitivity, specificity, positive and negative predictive values of p16INK4a ELISA among HIV-infected women undergoing cervical cancer screening as part of routine HIV care at the Family AIDS Care and Education Services (FACES) programme in Kisumu, Kenya.25 Women receive HIV education talks at the time of enrolment with information about basic gynaecological care, cervical cancer and strategies for screening.26 Women with serologically confirmed HIV infection, enrolled in HIV care and eligible for cervical cancer screening, were recruited for participation. Screening eligibility criteria included women who were 23 years or older, not pregnant, had no prior history of cervical cancer, had an intact uterus and cervix and had no lesion suspicious for cancer on examination. After signing informed consent, participants underwent pelvic examination with p16INK4a specimen collection using a collection brush swirled three times at the cervical os to capture exfoliated cells from the transformation zone. This was followed by visual inspection with acetic acid (VIA). After VIA, the initial clinician left the room and colposcopy was performed by a second trained clinician who was blinded to VIA results. The study staff (one nurse and one clinical officer) were trained and certified to perform colposcopy independently and had each performed over 300 colposcopies before study initiation. Colposcopic assessment was carried out in four steps. Clinicians identified normal cervical anatomy before and after acetic acid, using a green filter and after application of Lugol's iodine. Results were classified as normal, cervicitis, probable CIN1 or probable CIN2+. Women with a satisfactory colposcopy with no lesions were determined to have no disease.27 Women with unsatisfactory colposcopy, or visual impression of CIN2+ underwent cervical biopsy or endocervical curettage at the time of colposcopy. Disease status was determined by histopathological diagnosis in women who underwent biopsies. Biopsy specimens were stored in 10% buffered formalin at room temperature, and sent to the Department of Human Pathology Laboratory at the University of Nairobi for independent interpretation by two histopathologists. Specimens were read as normal, cervicitis, CIN1, CIN2/3 or invasive cancer. For women with two or more biopsies taken, the outcome was determined by the most severe diagnosis. For women with discrepant results from the same biopsy, final diagnosis was determined by consultation and consensus between both histopathologists. Treatment decisions were based on histopathology results. Demographic and clinical variables collected at the time of the visit included age, relationship status, number of partners, reproductive history, contraceptive use and current HAART regimen. Additional clinical variables were obtained from the paper file and electronic medical record. These included verification of HAART regimens, most recent CD4+ count, WHO stage, time since HIV diagnosis, duration of enrolment into HIV care and duration on HAART. Specimens for p16INK4a ELISA were collected on a cytobrush and transferred into a specimen collection vial with a prototypic sample lysis medium (MTM Laboratories, Heidelberg, Germany). Samples were heat stabilised at 100°C for 3 min within 30 min of collection and then stored in a −80°C freezer. Specimens were shipped on dry ice to the Department of Applied Tumor Biology at the German Cancer Research Center (DKFZ) in Heidelberg, Germany and/or the onsite FACES laboratory. A total of 460 (43.6%) women had samples sent to DKFZ, while 740 (70.2%) women had samples sent to the onsite FACES laboratory. Among the total cohort, 146 (13.9%) women had samples sent to both sites. The interclass correlation coefficient of p16INK4a values at the two sites was 0.89, which confirmed that p16INK4a ELISA would perform independently with valid and reproducible results in the FACES laboratory. In the laboratory, 100 μL aliquots of each processed sample were subjected in duplicate to a prototypic calorimetric sandwich-ELISA protocol (Cervatec, MTM Laboratories). Two p16INK4a-specific monoclonal antibodies were used: a capture antibody coated to the solid phase of a microtitre plate and a tracer antibody conjugated to horseradish peroxidase for detection of captured p16INK4a protein. For quantification of solubilised p16INK4a values, calibration curves had been established according to the manufacturer's protocol. p16INK4a concentrations in individual samples were calculated as arbitrary units (U/mL) using the standardised curve. For specimens analysed in both laboratories, the p16INK4a values were averaged. We based our sample size calculations on the CIN2+ prevalence of 7.2% previously seen in this clinic.26 We calculated that a sample size of 1100 women was needed to achieve a p16INK4a ELISA anticipated sensitivity between 70% and 80% with 95% CI 5% to −5%, comparable to that of cytology screening and VIA. To attain an anticipated specificity between 80% and 90% with 95% CI 5% to −5%, 500 women needed to be examined. Power analysis was performed using Power Analysis and Sample Size Software (PASS): V.2008 (National Council for Social Studies, Kaysville, Utah). We built receiver operating characteristic (ROC) curves to determine the p16INK4a cut-off values with the highest combined sensitivity and specificity for CIN2+, as determined by the area under the curve (AUC). Using the value with the greatest AUC, sensitivity, specificity, positive and negative predictive values of p16INK4a for detection of CIN2+ were calculated. Sensitivity analysis was performed for different outcomes, including CIN1+ (defined as CIN1, CIN2/3 and ICC) diagnosis by colposcopy or biopsy, CIN2+ diagnosis by only colposcopy or CIN1+ diagnosis by only colposcopy. Stratified analysis was performed by looking at test performance calculations after stratification by age (<35 or ≥35 years), HAART status, duration on HAART (≤18 or >18 months) or most recent CD4+ count (≤350 or >350 cells/dL). In order to determine the performance of p16INK4a at the determined cut-off threshold, we created a dichotomous variable named ‘p16INK4a prediction’, with two possible outcomes: correct or incorrect. Correct was defined as accurately detected cases of CIN2+ (true positives) and non-CIN2+ (true negatives). Women were classified as correct if they had p16INK4a greater than or equal to the determined threshold with biopsy-confirmed CIN2+ (positive gold standard result), or if they had p16INK4a less than the threshold and no CIN2+ by colposcopy or biopsy (negative gold standard result). Women were classified as incorrect if the p16INK4a value did not correctly predict the presence or absence of CIN2+. Women were classified as incorrect if they had p16INK4a greater than or equal to the threshold and no CIN2+ by colposcopy or biopsy, or if they had p16INK4a less than the threshold and biopsy-confirmed CIN2+. Student’s t-tests were performed for continuous variables, while χ2 tests were performed for categorical variables. Predictors found to be statistically significantly associated with correct p16INK4a prediction on univariate analysis (p<0.05) were included in the multivariate logistic regression model. Fit of the regression model was tested using R2. Statistical analysis was performed using Stata V.13 (StataCorp, College Station, Texas, USA). Between 25 October 2010 and 30 November 2012, 1134 HIV-infected women undergoing cervical cancer screening at FACES were enrolled in the study and underwent p16INK4a specimen collection and colposcopy with biopsy as indicated. Of these, 1054 (92.9%) had complete p16INK4a values and colposcopy and biopsy results (figure 1). The average age of participants was 34.5 years (±SD 7.8), 824 (78.2%) were on HAART, average duration on HAART was 18.0 months and median most recent CD4+ count was 506 cells/dL (IQR 355–685; table 1). Flow sheet of study enrolment, eligibility and outcomes. CCID, Cross-Sectional Study ID; CIN2+, cervical intraepithelial neoplasia 2+. At colposcopy, 203 (19.3%) women were biopsied on suspicion of CIN2+; of these, 126 (62.1%) had CIN2/3 confirmed on biopsy and 1 (0.5%) had stage IA1 ICC (figure 1). Colposcopy and biopsy results were combined to determine the final number of women with normal results, cervicitis or CIN1. For example, women were considered to have CIN1 if they had CIN1 on colposcopy alone (no biopsy), if they had unsatisfactory colposcopy and CIN1 confirmed on biopsy or if they had the impression of CIN2+ on colposcopy and CIN1 confirmed on biopsy. Among the 1054 participants, a total of 747 (70.9%) women had normal results, 160 (15.2%) women had CIN1, 126 (11.9%) women had CIN2/3, 20 (1.9%) women had cervicitis and 1 (0.1%) woman had stage IA1 ICC. The mean concentration of p16INK4a protein in cervical samples was 37.4 U/mL (±SD 42.0). The mean p16INK4a in the 747 women with normal results on colposcopic impression or biopsy was 32.6 U/mL (±SD 36.2). Mean p16INK4a in the 160 women with CIN1 on colposcopic impression or biopsy was 38.7 U/mL (±SD 41.5). Mean p16INK4a in the 126 women with biopsy-confirmed that CIN2/3 was 63.4 U/mL (±SD 59.7). The p16INK4a value in the woman with stage IA1 ICC was 210.0 U/mL. In these stratified results, women with cervicitis (mean p16INK4a=34.4 U/mL±SD 42.5) were excluded in the calculation of mean p16INK4a values, as they did not constitute normal results nor any form of premalignant disease. ROC analysis showed an AUC of 0.6639 for p16INK4a to detect biopsy-proven CIN2+ (figure 2A). The sensitivity analyses changing the outcome to any biopsy-proven or visual impression of CIN1+ (figure 2B) decreased the AUC to 0.6078. The AUC was 0.6445 for colposcopic impression only (without biopsy confirmation) of CIN2+ (figure 2C) and 0.6133 for colposcopic impression only of CIN1+ (figure 2D). 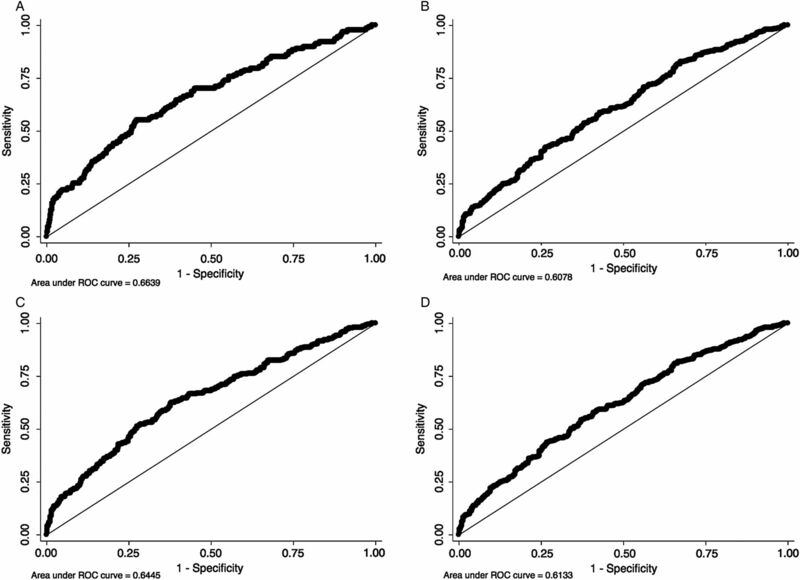 ROC curves (sensitivity vs 1—specificity) in primary and sensitivity analyses (n=1054). (A) Base case: true positives limited to biopsy-proven CIN2+. CIN2+ includes CIN2/3 and ICC. All other diagnoses were considered negative. AUC=0.6639. (B) Sensitivity analysis (1): true positives included any biopsy-proven or visual impression of CIN1+. CIN1+ includes CIN1, CIN2/3 and ICC. AUC=0.6078. (C) Sensitivity analysis (2): true positives included any visual impression of CIN2+ by colposcopy. AUC=0.6445. (D) Sensitivity analysis (3): true positives included any visual impression of CIN1+ by colposcopy. AUC=0.6133. AUC, area under the curve; CIN2+, cervical intraepithelial neoplasia 2+; ICC, invasive cervical cancer; ROC, receiver operating characteristic. The p16INK4a cut-off value with the highest combined sensitivity (89.0%) and specificity (22.9%) for biopsy-proven CIN2+ was 9 U/mL (table 2). The positive predictive value was 13.6% and negative predictive value was 93.8%. Overall, the p16INK4a positivity with the selected 9 U/mL cut-off level was 828 (78.6%) women; in comparison, biopsy-proven CIN2+ was found in only 127 (12%) women. When stratified by age (<35 or ≥35 years), HAART status, average duration on HAART (≤18 or >18 months) or most recent CD4+ count (≤350 or >350 cells/dL), no significant differences were found in regard to sensitivity, specificity or predictive values (table 2). Using a threshold p16INK4a level of 9 U/mL to predict CIN2+ diagnosis, there were 325 (30.8%) cases of correct p16INK4a prediction and 729 (69.2%) cases of incorrect p16INK4a prediction. On univariate analysis, age, relationship status, number of current partners, prior pregnancies, deliveries and delivery type, whether women were experiencing vaginal symptoms, amenorrhoea, menopause and time since HIV diagnosis were associated with correct p16INK4a prediction (p<0.05; table 3), and therefore were included in the final logistic regression model. An R2 value (range from 0 to 1) to measure the goodness-of-fit of our model to the data was calculated to be 0.0553 (p=0.001), indicating that our model gave little predictive information about the outcome of correct versus incorrect p16INK4a prediction. p16INK4a ELISA showed potential to be an effective cervical cancer screening test in low-resource settings based on its molecular function and performance on IHC and in prior studies in general populations. However, in our cohort of 1054 HIV-infected women, the assay did not perform well as a screening test. Our study provides well-powered estimates of the sensitivity and specificity of p16INK4a ELISA among HIV-infected women. We observed a similar sensitivity but much lower specificity compared with current screening methods used in the general population (high-risk HPV (HR-HPV) testing, Pap smear and VIA).28 Specificities are ∼73.9% for HR-HPV testing, 94.6% for Pap smear and 80.0% for VIA among the general population. Compared with sensitivity and specificity values from studies of HR-HPV testing in HIV-infected women, p16INK4a ELISA performed with similar sensitivity but lower specificity.29 ,30 Specificities from these studies were 55.7% and 77.4%, respectively. Differences between our study and other p16INK4a ELISA studies can be attributed to characteristics of the study setting and population. Our setting was an HIV care clinic in East Africa, compared with a general clinic population in developed countries. In order to evaluate the performance of p16INK4a as a stand-alone biomarker for cervical cancer screening, we collected the specimen prior to VIA or colposcopy. Prior studies have preferentially sampled acetowhite lesions, which may have increased the accuracy of p16INK4a. In addition, HIV-infected women may have intrinsic differences in p16INK4a expression, reflected in the higher mean p16INK4a concentration seen among our population. Overall, our mean p16INK4a concentration was 37.4 U/mL, compared with 33 U/mL in a previous study among the general population. Specifically, we had much higher p16INK4a concentrations within the subset of women with non-CIN2+. Our mean p16INK4a concentration among women with normal cervical examinations (32.6 U/mL) was four times higher than that among women with normal cervical examinations in the other study (8.7 U/mL).23 Our higher p16INK4a levels among HIV-positive women may reflect higher rates of infection with HR-HPV subtypes in HIV-infected women compared with HIV-negative women. There is higher p16INK4a in infections by HR-HPV subtypes, compared with low-risk subtypes.31 ,32 It is also possible that higher p16INK4a levels reflect higher HPV viral loads among HIV-positive women, even when comparing HIV-positive and HIV-negative women infected by the same HPV subtype. A recent study showed that among HIV-positive and HIV-negative women with normal Pap tests but who tested positive for a HR-HPV subtype (HPV 16), HIV-positive women were still found to have a 1.4–2.2 times higher risk for developing CIN2+ in 5 years;33 this may be attributed to HIV-positive women having higher HPV viral loads. The higher overall p16INK4a concentration in HIV-positive women indicates that it is critical to set an optimal p16INK4a threshold. Differentiation between CIN2+ and non-CIN2+ had the greatest AUC compared with differentiation between CIN1+ and non-CIN1+ (figure 2A, B). We did not differentiate between different types of high-grade CIN (CIN2 vs CIN3) in data collection, because management more significantly differs between women with CIN1 and CIN2+; treatment guidelines in a screen-and-treat strategy are similar for women diagnosed with CIN2 and CIN3. In our study, there is a dose-dependent increase in mean p16INK4a values from HIV-positive women with normal results (32.6 U/mL) to those with progressive levels of cervical dysplasia and cancer (38.7 U/mL for CIN1 to 63.4 U/mL for CIN2/3 to 210 U/mL for ICC). This suggests that p16INK4a is a promising biomarker in measuring progression of cervical disease. However, it may be difficult to choose a numerical threshold to distinguish CIN1 from CIN2+ in a population of women with high rates of HPV positivity and low-grade dysplasia. On the basis of our findings, p16INK4a ELISA measured in exfoliated cervical cells did not perform well as a cervical cancer screening test among HIV-infected women. We found a low specificity and positive predictive value for CIN2+. The low specificity of p16INK4a ELISA could result in an overburdening of the referral system and overtreatment in screen-and-treat settings. With the additional considerations for cervical cancer screening among HIV-infected women in low-resource settings, our study contributes to the ongoing search for a feasible alternative with high sensitivity and specificity for CIN2+. The authors would like to acknowledge Dr Emily Rogena and Dr Edwin Walong at the University of Nairobi for interpreting the histopathological specimens, and Dr Elizabeth Bukusi and the Director of KEMRI for their support of this study. UNAIDS, The Joint United Nations Programme on HIV/AIDS. Regional fact sheet 2014: Sub-Saharan Africa. UNAIDS communications [Internet]. www.unaids.org (accessed 6 May 2016).
. The President's Emergency Plan for AIDS Relief in Africa: an evaluation of outcomes. Ann Intern Med 2009;150:688–95. UNAIDS, The Joint United Nations Programme on HIV/AIDS. Global report: UNAIDS report on the global AIDS epidemic 2013. UNAIDS communications [Internet]. www.unaids.org (accessed 6 May 2016).
. The Papanicolaou test for cervical cancer detection. JAMA 1989;261:737–43.
. Cost-effectiveness of cervical cancer screening: comparison of screening policies. J Natl Cancer Inst 2002;94:193–204.
. See-and-treat in the management of high-grade squamous intraepithelial lesions of the cervix: a resource utilization analysis. Obstet Gynecol 1999;94:377–85.
. Barriers to follow-up of abnormal Papanicolaou smears in an urban community health center. Arch Fam Med 1999;8:129–34. World Health Organization (WHO). WHO guidelines for screening and treatment of precancerous lesions for cervical cancer prevention 2013. WHO communications [Internet]. http://www.who.int (accessed 6 May 2016).
. Colposcopy for the diagnosis of squamous intraepithelial lesions: a meta-analysis. Obstet Gynecol 1998;91:626–31. Contributors TJW carried out the data collection and organised the data, performed data analyses and interpretation, and drafted the manuscript. KS-M designed the study and performed data interpretation. MR and MvKD performed data interpretation. MM carried out the data collection. MJH designed the study, carried out the data collection, performed data interpretation and supervised the study. All authors provided critical revision of the manuscript on various drafts and also read and approved the final manuscript. Funding This research was supported by a grant from the National Institutes of Health (NIH), University of California, San Francisco-Gladstone Institute of Virology and Immunology Center for AIDS Research, P30-AI027763. TJW received research funds through the University of California San Francisco, School of Medicine, Dean’s Summer Research Fellowship. MJH received salary support and research funds through the NIH/NCRR/OD UCSF-CTSI Grant Number KL2 RR024130. Competing interests All authors have completed the ICMJE uniform disclosure form at http://www.icmje.org/coi_disclosure.pdf and declare: MvKD was shareholder and member of the board of MTM Laboratories (Heidelberg, Germany) at the time the study was initiated. MTM is a company, acquired by Roche in 2011, that makes p16INK4a ELISA kits, which were donated for this study and evaluated in this research. Ethics approval Ethical review boards at the University of California, San Francisco and Kenya Medical Research Institute (KEMRI) approved the study protocol in accordance with the US Department of Health and Human Services.